September 16, 2015  The American Red Cross allegedly did not fully cooperate with a government investigation of its performance and finances. Now investigators and a congressman want the charity's books open for audits. August 17, 2015  The charity has said it wants to "lead the effort in transparency." But when a congressman requested an inquiry into its disaster relief work, Red Cross officials wanted it called off. Saturday Mail Delivery: Safe For Now? 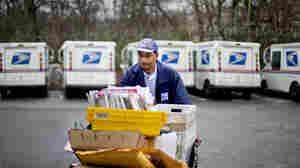 March 22, 2013  There's disagreement in Washington, D.C., this week on whether the USPS has the freedom to end Saturday mail delivery in August, as planned. The passage of a bill funding the federal government through September re-ignited the debate. January 20, 2011  A new report from the Government Accountability Office finds that the United States military spent about $193 million between 2004 and 2009 in connection with the Pentagon's "homosexual conduct policy." July 29, 2010  The government puts home genetics tests to the test, and warns that they don't live up to the hype.